Not lose time spent on billable hours that are eventually not billed? Know how much development time (and therefore the cost)? Want to be able to accurately bill your clients? Know how many hours you spend on non-billable projects or other work? Track actual project hours to detect project overrun and under run and analyze your estimation accuracy and your efficiency? Forecast time and costs for future development projects? Justify time to your client, and adjust your rates for specific projects? Do you want to implement timesheets successfully? Get it right with one click and/or automatic time tracking! Advance and start using automatic time tracking and calendar integration. You will never miss any billable hours. Graphical timesheet integrated with calendar. Budgeting report shows actual vs. estimated time. To make a project on time, on budget and with good quality. Get help from TimeCamp to make sure your projects are going well. See project profitability, and see problems before they arrive. Improve predicting and estimating projects. You will have a complete history of your project portfolio and actual vs. estimated time. "TimeCamp time tracking features are awesome, reporting is awesome. The changes implemented recently like the ability to sort the timesheet and the ability to select billable, non-billable, or both in all reports is awesome. Currently, I manage my time in TimeCamp, my to-do list in Todist, and my project management in Trello"
Invoice based on billable hours worked generated in TimeCamp. Use time entries to bill your clients or to measure project profitability. Track how many billable hours people work on paid project, and how many hours are spent on non-billable projects or other work. It's simple. Employees can to log their hours worked, so that you can pay them for the hours worked at the end of the month. "TimeCamp will open your eyes to how the day is spent." "TimeCamp really does find and make you time." Pin down what you are actually doing, how much time is wasted (or not). Visibility of what colleagues are doing. Productivity report showing top productive apps and sites. TimeCamp has given visibility and trust for each other’s time management choices and, in any team, trust is the paramount to making the total effort greater than the sum of the parts. 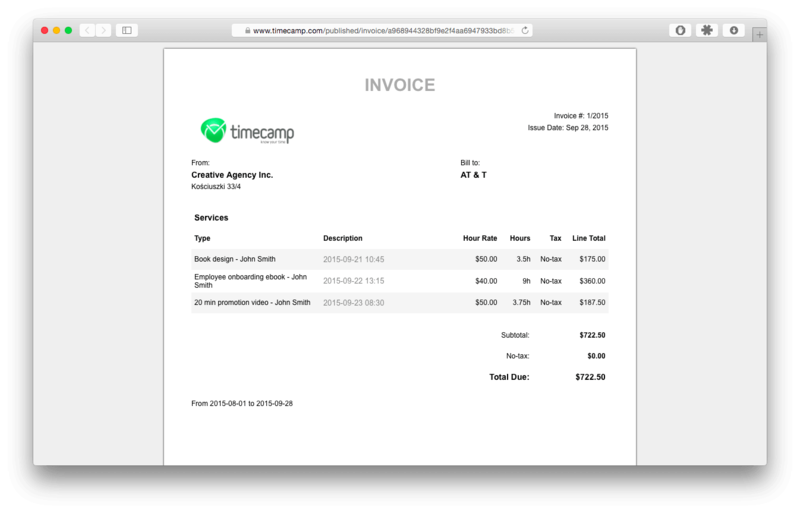 "Since I have discovered TimeCamp it has made being a freelance worker 100 times easier! I wouldn't know where to start if I couldn't use it." "TimeCamp reveals and removes the common distractions from our teams flow - having it running is like having an extra hour to give back to everyone in your team every day." Our goal for from TimeCamp is to have the equivalent of Google Analytics for people’s computer use and offline work time so that users can see their average start/finish times, hours worked per day/week/month, breaks, and more. Professional service companies, agencies, consultants. Any professional working person or team, looking for good, comprehensive software (online web app) to track anything that's related to its time management. A productivity fanatic, a student. Office managers, small teams, agencies. People who want to be more efficient. Lawyer, consultant, customer support agent. Start-ups and anyone using multi-level project management processes. People switching task very often. Service-oriented businesses who want a simple way to track time against issues and generate invoices for clients. That's what we need, at least.